Travelers looking for adventure of the unusual kind – here’s a new group of seven accommodations. Add this group to the 7th Heaven and The Magnificent 7 bunch from posts past and the collection spans the globe. There something for everyone. These locations cover everything from luxury in the high Himalayas to the hearty comfort of vintage train cars from US railroads. All unique places guaranteed to make your travels memorable. Buen viaje! Want to soar high above sea level in the Kingdom of Bhutan? Amankora’s five lodges offer travelers breathtaking views of Bhutan’s remarkable landscape along with its rich cultural heritage while nested beneath the gorgeous Himalayan peaks. Lodges located in Bumthang, Gangtey, Paro, Punaka, and Thimpu vary with the landscape in which they are situated – from pine forests to orange orchards and rice terraces. 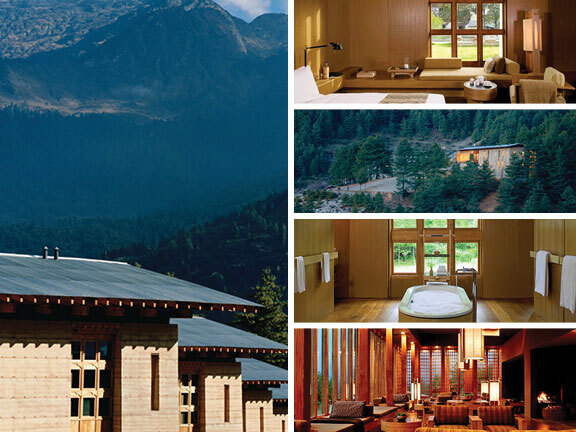 They all fuse the traditional feel of Bhutan with 21st century amenities and are designed for those seeking both relaxation and the opportunity to trek the rugged Himalayas. With open-plan bedrooms and living rooms with window seats alongside traditional bukhari wood burners, and en suite bathrooms featuring a large freestanding bathtub at their center, each lodge serves as the perfect post-exploration respite. Fan of traditional lodgings – with a slight twist? In the lively Zaan region of the Netherlands, this stacked-house façade exudes charm. The architectural combination of traditional style and reimagined inventiveness yields modern comfort that sets this four-star hotel apart. 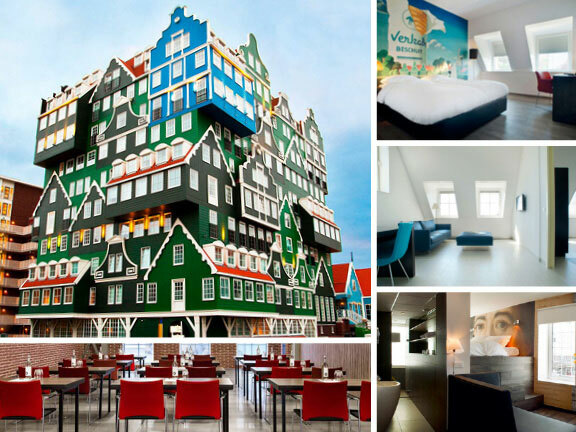 The ZAAN region has an industrial heritage and its history is reflected in the hotel’s beautiful decor through a modern eye. The Bar & Restaurant Puur Saen focuses on locally-sourced ingredients and serves up local fare along with an international menu. For cave dwellers looking for a unique modern feel, The Serinn House boasts unparalleled views around Ürgüp. Offering guests luxurious comfort, it leads the pack of cave hotels in the region. 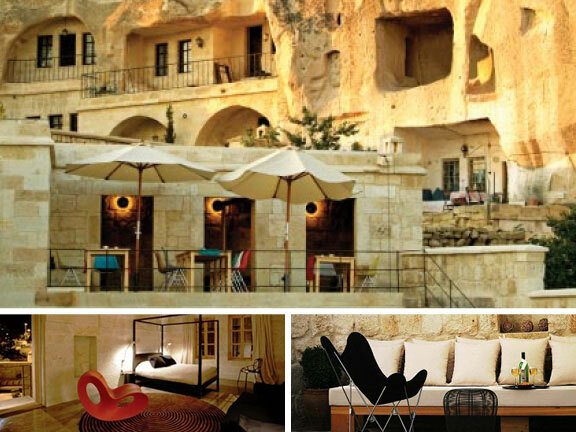 With only five guest rooms, each is uniquely designed by the Turkish architect Rıfat Ergör to reflect the beauty of the natural caves, and is accented with a modern sensibility. It’s the best of both worlds! Offering traditional Turkish hospitality in timeless caves, owner Eren Serpen has extensive knowledge of the Cappadocia region. The Serinn is a memorable stay whether you are an explorer of the many sites in the region, or simply looking to relax amidst a breathtaking landscape. Amenities include phone and wifi, private showers, guest laundry, parking and an excellent sleeping experience on fine cotton linens and an orthopedic mattress. Like the passion of bullfighting, not the actuality? 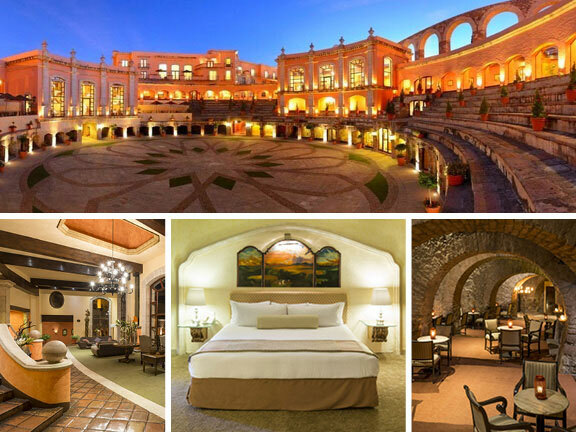 Built around the famed 19th century San Pedro bullfighting ring, this cobblestoned treasure was converted into a five-star hotel in 1989, more than a decade after the last bull run. The sumptuous hotel offers 49 suites with vaulted ceilings encircling the old arena. Preserving the character and beauty of the original structure, the brick-walled bar occupies the former bullpens, and the restaurant overlooks the arena. The patio, stores and common areas maintain the atmosphere of the ring and exude the fervor of the sport. Curious about spending a night in jail? In your own solitary confinement cell? Our friends in the north have converted a 150-year old jail into a youth hostel. Even better – rumors are it’s haunted. Live among the stone walls and iron doors – though you’re free to leave when you want. Located in the heart of Ottawa, the city awaits you. This landmarked building is preserved with all its character and history. From the solitary 3′ x 9’ cells and the bunk doubles to the eight-bunk dorm-style cells, it may be as close as anyone wants to get to incarceration. 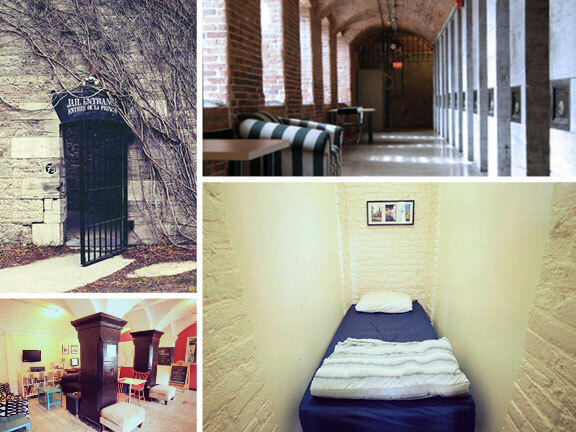 Of the many amenities offered, the most unique is the free tour of death row. 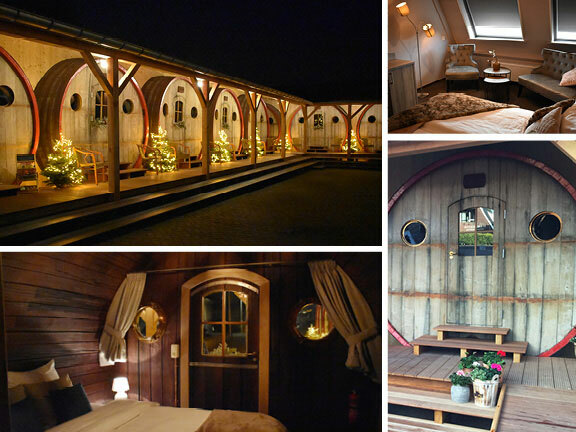 Oenophiles, this one’s for you: Stay in a real wine barrel! 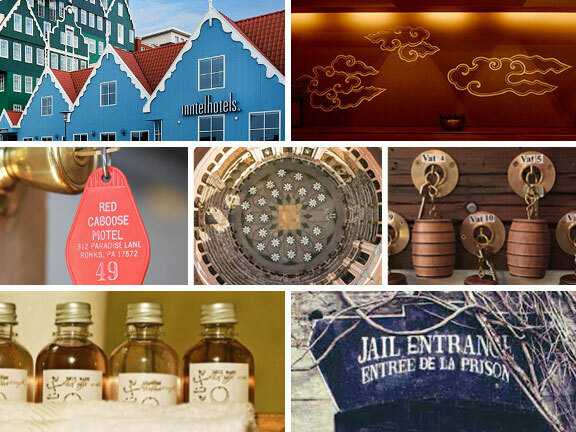 Twelve original wine vats have been converted into cozy hotel rooms. Eight large wine barrels offer modern comfort with a spacious lounge, a luxurious bathroom and a Smart TV. The remaining four barrels offer comfortable decor on a smaller scale. Traditional rooms are also available providing access to the same extensive wine options. A beautiful view of the old Stavoren harbor lies off the port terrace. Ship traffic, including many original models, are docked in the harbor making a leisurely glass of wine in the afternoon a perfectly relaxing experience. The highlight of the De Vrouwe van Stavoren is the Wellness-Wine Bar constructed in a large cask, where a great bottle of wine is only a short walk away. Don’t love train travel, but love trains? Relax in cabooses in the heart of Pennsylvania’s Amish community. Surplus cars from the Pennsylvania Railroad have been turned into a 38-room motel. Each caboose is unique, painted in a theme echoing America’s famous railroads, and features cable, wifi, refrigerators and other amenities. Some cabooses have private decks overlooking historic Lancaster County. 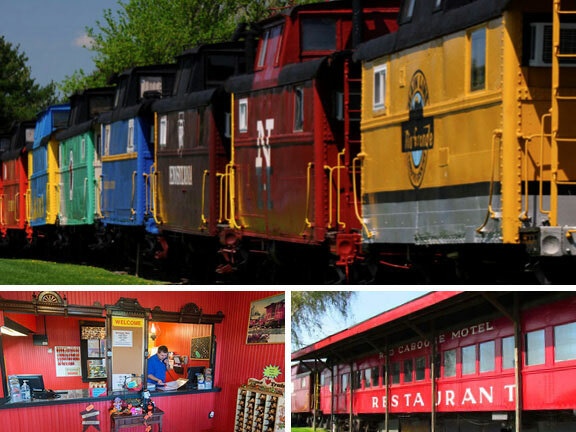 The dining car in The Red Caboose is a relic from the Pennsylvania Railroad and boasts authentic railroad chow. The menu at Casey Jones’ offers fare with flavors from the US and around the world. Any great accommodations to add? This entry was posted Tuesday, August 22nd, 2017 at 6:17 am	and is filed under just curious, travel. You can leave a response, or trackback from your own site.